* "Whether a fan of J.M. Barrie's classic tale or new to Neverland, readers will be clamoring for more from this enchanting world." * "Readers will delight both the story and the storytelling." "Featuring a lively, colorful cast, and a droll narration with snarky asides by an anonymous, self-proclaimed pirate authority, this entertaining take on the Peter Pan story neatly blends action-adventure and comical and heartfelt moments." 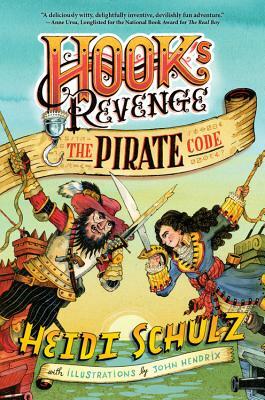 Heidi Schulz is a writer, reader, giraffe suspicioner, and the author of Hook's Revenge. She lives in Salem, Oregon with her husband, co-captaining a crew made up of their teen daughter, a terrible little dog, and five irascible chickens. Visit her website at HeidiSchulzBooks.com or follow her on Twitter @HeidiSchulz. John Hendrix loves to draw. In fact, he's drawing right now in St. Louis, Missouri. He lives there with his wife and two children, and teaches at Washington University. His drawings have been featured in numerous publications, and he is the author and illustrator of many acclaimed children's books. Visit John online at johnhendrix.com and follow him on Twitter at @hendrixart.